Give your customers the best, most colorful lilies on the market… all in one convenient mixture! 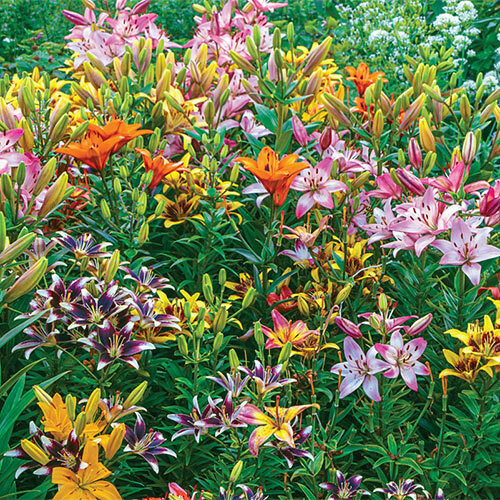 We've selected a fantastic blend of Asiatic lilies to add a bounty of bold forms and brilliant hues to any sunny or partially shaded site. So, for a low-maintenance display that really makes a scene, we suggest planting this gorgeous selection along the back of a summertime (perennial) border, in a mixed cutting garden or as a focal point stunner. Customers will notice an increase in butterfly activity around these areas, as pollinators simply adore the open form these lilies readily display. The showy, easy-to-grow blooms lure plenty of human admirers, too. Upright or outward facing flowers with a diameter of approx. 5 to 6".